The Korea Tourism Organization opened Korea Plaza, which is a Korea tourism and culture center. If you plan to go to Korea, visit Korea Plaza and get tour guide books, maps and other materials for free. Moreover, various Korean Cultural experiences and daily events are waiting for you at Korea Plaza. Korea Tourism Organization(KTO) & King Sejong institute are delighted to announce that King Sejong institute(or 'Sejong Hakdang in Korean) now opened at Korea Plaza KL in Malaysia. 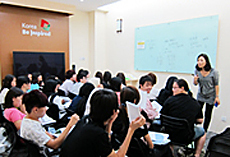 Visit Korea Plaza KL – Fill in the reservation form and priority to attend the classes will be given according to first come first serve basis. 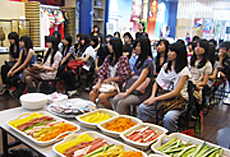 You can taste and learn how to cook famous Korean delicacies by attending Korean public cooking class at Korea Plaza! Do you want to dance like a real K-POP star? 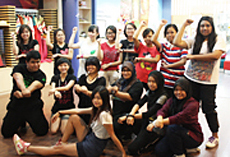 Visit Korea Plaza KL now & start to learn how to dance like K-pop star! Free venue supply for Malaysians who organize K-pop star fans gathering at Korea Plaza. Free hanbok trying and photo taking while having fun here~! Are you a tourist or a traveler? Do you prefer a tour package or go on free & easy? How do you plan your trip? Where to find out what to eat, see, play, shop in the Land of the Morning Calm or better known as Kimchi Land when annyeong-haseyo is the only phrase you know? Let’s have a date! Listen from and share with the Korea specialists at the monthly.